Manhattan landmark ranks number 3 for going number 1 and 2. If you've got to hightail it to the potty during a performance at Radio City Music Hall, rest assured that the facilities are among the best in the nation. The famed theater's luxurious bathrooms -- conveniently located across the street from us here at 30 Rock -- feature classic tile work, art deco furnishings, 1930's design and unique touches like cork-covered walls, which have earned Radio City a highly coveted designation. 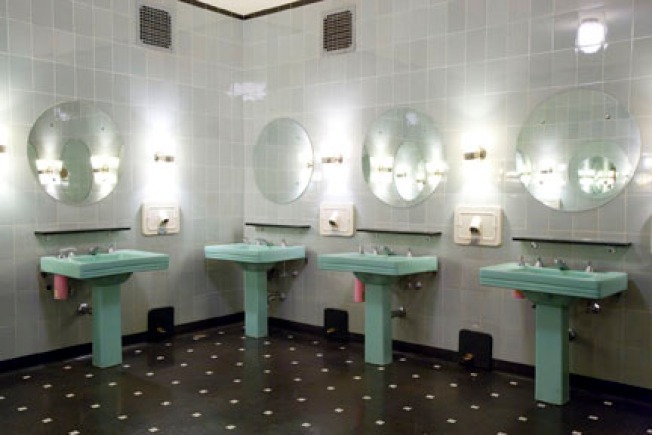 Radio City's bathrooms ranked third best out of all theaters in the country nominated for the annual "America's Best Restroom" contest, now in its eighth year. Restrooms at the Shoji Tabuchi Theater in Branson, Miss., earned top honors. Rounding out the top five were The Tremont Plaza Hotel in Baltimore (No. 2), Zeffirino Ristorante – Venetian Resort, Hotel & Casino in Las Vegas (No. 4) and The Drake Hotel in Chicago (No. 5). Cincinnati-based Cintas Corporation, a provider of restroom hygiene products and services, sponsors the annual contest.